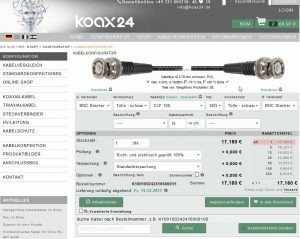 The RG 058 is a flexible and favourable coaxial cable for many applications (75Ω see RG59). This line complies with the UL-Standard MIL C 17. Compared to the RG58, the RG 058 has better attenuation values. 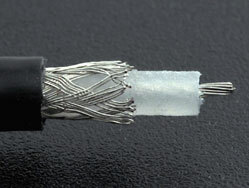 The RG 058 is a 5.00 mm thick, favourable coaxial radio frequency cable. Single shielded and suitable for most applications, e.g. measuring lines and antennas. The conductor is isolated by the dielectirc medium and is in the centre of the cable. The gemoetry must be very accurate and precise. 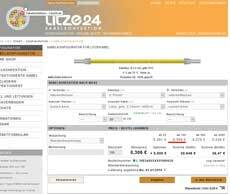 When a coaxial cable is bent with a smaller bending radius than permitted, the electrical values won’t be met anymore and the cable is no longer suitable for certain applications. BNC, TNC, RP-TNC, N, UHF, Mini-UHF, RP-SMA, SMA, Lemo S1 et al.